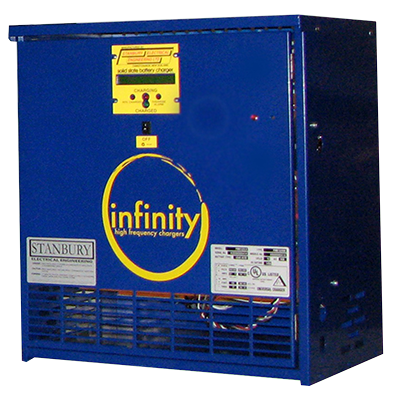 Infinity high frequency chargers utilize a full bridge IGBT switch mechanism to creat the most pure DC output available from an industrial battery charger today. The Infinity PEI profile gives chargers the ability to adjust to different applications and environments. dv/dt dl/dt control termination ensures proper recharge without the waste of energy or damage to a battery caused by improper charge return. Infinity high frequency chargers are the most energy efficient chargers on the market. This includes conversion of AC to DC and DC % stored in the battery for the greatest round trip efficiency. Infinity chargers are reliable by design. Efficient energy conversion coupled with a well engineered heatsink make Infinity chargers the only high frequency charger with no moving parts. All internal connections are designed for mechanical and electrical reliability.